Another recording today! This time is the studio recording that Ensemble Schallfeld did of my “…in jeder Hinsicht indirekt…” (2017-18), for Baritone Sax, Piano, Percussion, Double Bass and Live Electronics. This piece was written after the text “Die Sehnsucht der Zellen” by Alexander Kluge and was comissioned by IMPULS as part of the Text im Klang #3 Project. Eine weitere Aufnahme heute! Diesmal ist es die Studioaufnahme, die das Ensemble Schallfeld von meiner “…in jeder Hinsicht indirekt…” (2017-18), für Bariton Sax, Klavier, Schlagwerk, Kontrabass und Live Electronics gemacht hat. Dieses Stück wurde nach dem Text “Die Sehnsucht der Zellen” von Alexander Kluge geschrieben. Es wurde von IMPULS im Rahmen des Projektes Text im Klang #3 in Auftrag gegeben. Das Stück wurde am 1. Juni im Großen Minoritensaal Graz uraufgeführt. So here you go with the recording of my ensemble piece “a drop of honey” (2018), for 13 musicians, premiered by the Ensemble für Neue Musik Kunstuniversität Graz conducted by Edo Micic. The concert took place on June 13th at Großer Minoritensaal Graz. Hope you enjoy it! Also gehts mit der Aufnahme meines Ensemblestücks “a drop of honey” (2018), uraufgeführt vom Ensemble für Neue Musik Kunstuniversität Graz unter der Leitung von Edo Micic. Das Konzert fand am 13. Juni im Großen Minoritensaal Graz statt. Hoffe es gefällt euch! You can already listen to this wonderful recording of my piece IMPACT / TREMORS / SHIFTING (2017/18), with the Orchestre Philharmonique de Radio France + Ulysses Ensemble conducted by Peter Rundel. The premiere took place at Centquatre Paris, on June 23rd 2018, as part of the final concert of the Orchestral Reading Workshop of the IRCAM’s ManiFeste Academy 2018. My piece Impact / Tremors / Shifting (2017-18), written for l’Orchestre Philharmonique de Radio France, was premiered at Centquatre Paris during the final concert of the Orchestral Reading Workshop of Ircam’s ManiFeste 2018, under the baton of Peter Rundel. Here you can find all the information regarding the premiere of my new piece …in jeder hinsicht indirekt… (2017/18), for Baritone Sax, Percussion, Piano, Double Bass and Live electronics; a comission by Impuls, part of the Text im Klang Projekt. The program also includes music by Jinwook Jun, Anna Korsun, Francisco José Domínguez Robles and Elena Rykova. There will also be an open brunch where we’ll discuss our pieces, taking place the morning after the concert. See you there! Hope you enjoy! Hugo Warinsky interviewed yours truly at the end of Université D’Altitude International Workshop for Young Composers (Saint-Martin-Vèsubie, France, 2016), so here you can listen to me [trying to] explain the musical ideas behind my Vértigo (2016), which was wonderfully premiered back there by the amazing Ensemble Multilatérale. Hope you enjoy or, at least, have fun! I am pleased to share the recording of the premiere of my piece Vértigo (2016), for Bass Flute, Bass Clarinet, Harp, Violin and Violoncello. It comes from the second concert of the Université D’Altitude 2016 — with Yann Robin and Raphaël Cendo as teachers and the Ensemble Multilatérale as visiting ensemble— that took place on July the 9th at the Eglise Notre-Dame de l’Assomption, Saint-Martin-Vèsubie, France. I must thank all the musicians of the ensemble for their magnificent work during the whole Academy an also for their brilliant performance. I am so happy to share this new recording by the magnificent Ensemble neoN, from Norway. They performed this little quintet fiercely during the first concert of MATA Festival 2016, which took place on April the 12th at Scandinavia House, New York City. I am very thankful for their great work! The recording is amazing. I hope you enjoy it! Here you go with a recording of my recently premiered piece …you took my breath away… (2015-16), for Flute and live electronics (controlled by Myo Armband). It comes from the concert that took place at Fundació Phonos’ Concert Hall (Universitat Pompeu Fabra de Barcelona) on last Monday, April the 26th. The flutist is Joan Pons, from Barcelona Modern Project Ensemble, who did an amazing and really committed job. 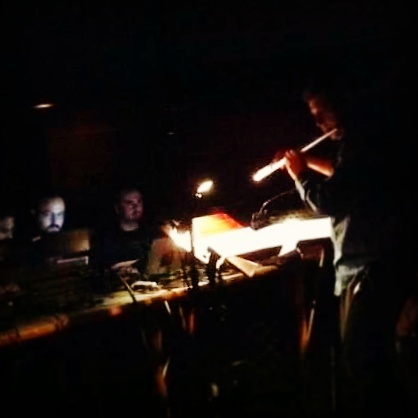 Here’s a nic pic of last night’s performance of my piece “…you took my breath away…” (2016), for flute and live electronics. It was premiered by Joan Pons at the Phonos Foundation, Universitat Pompeu Fabra de Barcelona. Thorough and passionate performance! Thank you so much! My new piece …you took my breath away… (2015-16), for flute and live electronics (controlled by Myo armband), will be premiered by Joan Pons tomorrow evening (19.30) at Fundació Phonos (Pompeu Fabra University, Barcelona), in the final concert of the International Course for Composers Barcelona Modern Project-Institut Français. Here you will find more info on the program, all mixed media music. Don’t miss it! There you go with two reviews of the concert by Ensemble neoN —last Tuesday, April the 12th, at Scandinavia House, NYC—, the opening night for MATA Festival 2016. They played music by Alexander Kaiser, Seán Clancy, Jan Martin Smørdal, Matthew Welch, Neil Luck and my Don’t Condescend [Don’t Even Disagree] (2014), for quintet. The first one is by The New York Times’ critic Anthony Tommasini, the second is by New York Classical Review’s George Grella. So! The New Yorker just announced the first concert of MATA Festival 2016, where Ensemble neoN will perform my quintet Don’t condescend [Don’t even disagree] (2014), along music by Alexander Kaiser, Matthew Welch, Seán Clancy, Neil Luck and Jan Martin Smørdal. Here’s the link. Check it out and get your tickets soon, if you haven’t already! My piece Don’t condescend [Don’t even disagree] (2014), for quintet, will be performed by Ensemble neoN (in their concert “Northern lights“) on April the 12th at Scandinavia House (58 Park Avenue), New York City, during MATA Festival 2016.